At Civil Eats, we often get inquiries from people across the U.S. who want to start volunteering or working in the food system, but aren’t entirely sure how–or where–to get their hands dirty. The good news is there are myriad ways to make a meaningful impact, whether in your backyard or across the globe. You could join a local food policy council, start a petition on Change.org, write a blog, set up informational interviews with food system leaders, take an online course, join or start a community garden, or learn from others about how they got started. There are also several great organizations that we think are making a difference. Below, we’ve listed a number of groups from multiple sectors in the food system which regularly offer opportunities for people looking to become more involved, including volunteer and internship positions, entry-level jobs, and academic and vocational programs. National Family Farm Coalition – NFFC represents family farmers and rural communities in the face of economic pressures and inequities. The organization regularly supports interns and volunteers who contribute to the organization’s work to protect and strengthen farmer livelihoods through communications, research, and policy analysis. National Young Farmers Coalition – NYFC is dedicated to ensuring that the next generation of farmers can grow food on ecologically vibrant, affordable land. The coalition offers internships in campaign development, blogging, and event planning. National Sustainable Agriculture Coalition – NSAC is “an alliance of grassroots organizations that advocates for federal policy reform to advance the sustainability of agriculture, food systems, natural resources, and rural communities.” The organization offers paid, full-time internships three times a year to work in their Policy and Grassroots departments. Pesticide Action Network North America (PANNA) – PANNA is one of five regional centers working to build an ecologically sound and socially just food system by eliminating the use of pesticides and hazardous chemicals in agriculture. The organization regularly supports volunteers and interns in developing skills in the nonprofit and advocacy sectors. Rodale Institute – Rodale Institute researches and promotes best practices in organic agriculture to farmers, scientists, and consumers, and advocates for policies that support farmers. The organization typically offers seasonal fellowships from early spring to late fall. World Wide Opportunities on Organic Farms (WWOOF-USA) – WWOOF-USA offers workers the opportunity to connect with sustainable farmers across the U.S., exchanging labor for on-farm room and board. North East Workers on Organic Farms (NEWOOF) – NEWOOF is a regional farm apprenticeship placement service that facilitates connections between farms and workers in the Northeastern U.S. The Food Trust – Based in Philadelphia, The Food Trust works to ensure that “everyone has access to affordable, nutritious food and information to make healthy decisions.” The organization regularly hosts student interns from a variety of backgrounds, including public health, social work, writing, nutrition education, business, tourism and hospitality, urban gardening, special events, community development, public policy, and urban studies. Food and Water Watch – Food and Water Watch is a national consumer advocacy organization that challenges the “corporate control and abuse of our food and water resources.” Internship opportunities are available three times a year to undergraduates, recent graduates, and graduate students. Food First – Food First is a think tank that advocates for policies that support a just, ecologically sound food system. Interns contribute to the organization through written work on issues related to food justice and food sovereignty, and many interns complete one or more publications. Slow Food USA – Slow Food USA supports a global food system that is good, clean, and fair for all. The organization has 170 local chapters and 40 campus chapters across the U.S. and aims to preserve food cultures, cultivate new leadership, and connect communities through food. Slow Food USA offers internships year-round in a range of fields, including development, policy and advocacy, and operations. American University Master of Science in Nutrition Education – For those looking to promote better nutrition in their communities, American University offers an online degree program that targets healthy changes in large institutions. Berkeley Food Institute – BFI is an interdisciplinary institute at U.C. Berkeley designed to promote more resilient and just food systems, both on the local and global levels. BFI has over 75 affiliated faculty and staff on the U.C. Berkeley campus. Center for Urban Education about Sustainable Agriculture – CUESA offers education programs for urban eaters to learn more about local farmers and sustainable agriculture, and operates the Ferry Plaza Farmers’ Market in San Francisco. CUESA regularly posts opportunities for volunteers to develop skills in community education, communications, and outreach. Johns Hopkins Bloomberg School of Public Health – JHBSPH offers academic programs in health and behavior, public policy, and nutrition. The university also houses the Center for a Livable Future and the Global Center on Childhood Obesity. Marylhurst University Department of Food Systems and Society – Marylhurst has a Masters of Science program in food systems and society. The interdisciplinary curriculum focuses on equity, justice, and sustainability in our food system. NYU Steinhardt School Food Studies Program – NYU offers undergraduate, graduate, and doctoral programs in a range of issues across the food system, including public health and nutrition, food and culture, and public policy. Tufts Friedman School of Nutrition Science and Policy – Tufts’ food studies curriculum focuses on two main areas of study: Health and nutrition and food and agriculture policy. University of Vermont Farmer Training Program – Those aspiring to step into the field and begin farming can participate in UVM’s six-month beginning farmer training program. The course of study covers several topics in sustainable land management through hands-on, experiential learning. Yale University – Yale offers undergraduate courses and graduate programs in agrarian studies. The university also sponsors the Yale Sustainable Food Project and the Rudd Center for Food Policy and Obesity. U.S. Department of Agriculture – USDA offers internship and career development opportunities for young people in high school, current undergraduate students, and recent college graduates. USDA also partners with organizations who offer stipends for students of color interested in pursuing unpaid internships with a federal agency. U.S. Senate Committee on Agriculture, Nutrition, and Forestry – The Senate Ag Committee offers internships and fellowships in the spring, summer, and fall. Individuals with interest in agricultural-related policy are encouraged to apply. While all candidates will be given full consideration, preference is given to students, and also those whose permanent residence is the Chair or Ranking Member’s home states. In order to proceed in submitting an application, please select the office to which you are applying, the Democrat or Republican office of the Committee. Bill Emerson National Hunger Fellowship – The Emerson National Hunger Fellows Program trains the next generation of anti-hunger leaders through a combination of community-based field and national policy work. Participants learn about a range of approaches to eliminate hunger, poverty, and social inequality (particularly racism), and develop skills in areas such as program development, research, evaluation, outreach, organizing, and advocacy. FoodCorps – FoodCorps is a year-long service program designed to promote healthy school food by educating children, building and maintaining school gardens, and bringing high-quality local food into public school cafeterias. Food Research and Action Center – FRAC is a research and advocacy organization that focuses on community, state, and national level solutions to eliminate hunger and under-nutrition across the U.S. The organization regularly hosts interns and volunteers to develop skills in research, writing, and advocacy. Hunger Volunteer – A project of New York City Coalition Against Hunger (NYCCAH), Hunger Volunteer educates donors and the public about the impact of and solutions to hunger across the U.S. The program connects volunteers with anti-hunger organizations nationwide. Urban Nutrition Initiative – Based in Philadelphia, the UNI program provides paid internships in food education and urban agriculture to high school students during both the school year and the summer. UNI interns play a significant role in improving community food systems through participation in multiple regional and national networks and conferences. FairTrade – FairTrade certifies products sold in the U.S. as fair trade in order to promote sustainable, ethical entrepreneurship across the globe. The organization regularly offers internship opportunities that build participants’ skills in research and writing on international development. HelpX – HelpX includes listings for farms and ranches who invite volunteer helpers to stay with them short-term in exchange for room and board. Mickey Leland International Hunger Fellowship – The Mickey Leland International Hunger Fellows Program is a two-year program that builds fellows’ skills to eradicate hunger and poverty worldwide. Fellows spend the first year working directly to promote food security in the field, and the second year applying their experiences to develop sound national and international development policies. Oxfam America – Oxfam aims to end poverty and hunger worldwide by focusing on long-term solutions to injustice. There are several ways to get involved both in your local community and in the organization’s national offices in D.C. and Boston. World Wide Opportunities on Organic Farms (WWOOF) – WWOOF offers workers the opportunity to connect with sustainable farmers across the globe, exchanging labor for on-farm room and board. COMFOOD Jobs – Allows individuals and organizations to post and search for jobs in the food and agriculture sectors. Based out of the Tufts Friedman School of Nutrition Science and Policy. Farm and Food Jobs – Connects job seekers and prospective employers in agriculture and food related industries across all steps along the food chain. Good Food Jobs – Help job seekers looking for meaningful food work find opportunities with farmers, restaurateurs, policy maker, economists, ecologists, and more. GFJ’s gastrognomes blog profiles food professionals across multiple sectors to highlight how people develop their careers in the food system. Have another great resource to share? Let us know! Our annual Sustainable Ag Conference is a great place to learn about the latest sustainable farming techniques, how to advocate for fair farm and food policies, and to dig deeper into how you can change the food system. We offer one-on-one technical assistance and grants to farmers looking to become organically certified, GAPs certified, or retail ready. And, we work with communities to grow local and organic food systems and offer the nation's largest sustainable farm tour. I am an advocate of your media and of the movement to better shape our food system towards needs and values. However, I think the most significant thematic area you did not mention is enterprise/business. Clearly there is a negative association with conventional/status quo business, maybe even large business/corporates, however, I think that is where the change needs to happen if we are going to address the systemic challenges. Maybe looking at it through the lens of "what firms/businesses/enterprises are doing the things that will lead us towards producing, processing, packaging, distributing, educating, etc. in a more healthy, inclusive, just, environmentally regenerative/balanced way?" I want to recommend FarmsReach as a resource for beginning farmers and ranchers. The website has toolkits, resources and an open forum where job and internship opportunities are often posted. ATTRA/ NCAT also has an incredible internship listing. ChangeLab Solutions develops law and policy strategies advocates can use to help their communities increase access to healthy, affordable, and fresh food. We cover several aspects of the food system, including establishing urban agriculture opportunities, promoting farmer’s markets and healthy mobile vending, improving corner store offerings, and attracting grocery retail to smaller communities. We encourage recent grads of public policy, public health, urban planning, law schools, or similar to get involved with us through our fellowship program. Slow Food USA has 200 chapters in communities around the country who work on projects involving everything from school gardens, youth farmers markets, and garden to cafeteria to biodiversity, community building, crop mobs, and food justice. Almost everything is done by volunteers. You can visit the slowfoodusa.org web site to learn more and find a chapter near you. California Institute for Rural Studies work to increase social justice in rural California for all residents, building sustainable communities based on a healthy agriculture. Foremost in our work will be marginalized populations. The goals of our public interest research are to strengthen social justice and increase the sustainability of California's rural communities. 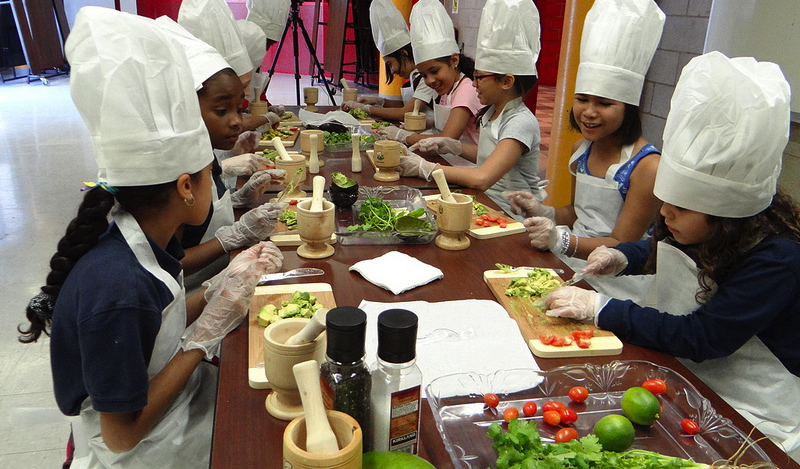 Thank you for promoting involvement in transforming the food system...especially at school. But let's not forget that these school food systems in large districts especially, are massive enterprises of procuring and distributing food. Food Service administrators are hobbled by stringent procurement rules and bidding processes as well as financial restrictions. If you really want to make an impact, get to know your Food Service Administrators, School Board and State Govt officials. Too many well-meaning folks barge in with their ideas and demands and you end up with gridlock. No one wins. Fictional book series for kids (and adults) to read together or in gardening class: the Seed Savers Series. Set in a future where gardening is illegal and real food eliminated from the national diet, the series offers gardening, adventure, politics and asking the hard questions. In Iowa, there are 15 Regional Food System Working Groups all doing great work throughout their various regions of the state. It is a place for individuals, organizations, and businesses to get involved in local, grass root efforts involving food system work. Our group is Eat Greater Des Moines and is based in Des Moines. (www.eatgreaterdesmoines.org) Thanks! FamilyFarmed.org is working in the Midwest to help farmers develop markets and inform the public about improving their food choices. Wonderful list! Don't forget that National Young Farmers Coalition for Agriculture. Also, the Schumacher Institute does some very interesting things at the intersection of food/policy/economics. No seeds, no food. Don't forget the seed piece to this story. Most of the seeds now used in the emerging local food movement still come from thousands of miles away and include industrial hybrids which prevent us from saving our own seeds and the continuation of adaptation to our own climates. Seed School is a 6-day program designed to get farmers, gardeners and educators up to speed. It is SO helpful - & inspiring - to see so many groups & resourced listed together this way. Thank You. Also, our worker co-op, Equal Exchange, helped to jump-start the Fair Trade movement in the US back in the 80's and for those seeking to learn more about it we recommend the Fair World Project (see http://fairworldproject.org/overview/fair-trade/ ) and the Fair Trade Resource Network ( http://www.ftrn.org/ ). Although the FTRN will, sadly, be closing its doors soon we hope the site will remind up for awhile as it's a great place to learn more about Fair Trade. It was with great pleasure to hear the interview of my daughter and her life's work. Thank you for a fine Fathers Day gift. This page has been so helpful!! Thank you! As a post undergraduate student looking for opportunities in Agriculture Science and Food justice, I found this post very helpful.